[zmashiah] has a nice Nova tube amplifier in his living room, and he often forgets to turn it off once he’s done listening to music. He feels guilty when this happens, as it not only shortens the lifespan of his stereo, but it’s not exactly the greenest behavior either. Rather than let his receiver idle any longer, he built a simple device that automatically turns it off when he forgets. He wired an Arduino to the line level output of the receiver, sampling the audio every two seconds. When five minutes pass without an audio signal, the Arduino sends an IR command to the receiver, turning it off. He says he’s aware that it might be overkill to use an Arduino for this application, but that he would rather fork out an extra dollar or two instead of spending hours poring over AVR assembly code. While we’re all for efficiency, we can’t exactly argue with that logic – time is money! [zmashiah] is kind enough to include his schematics as well as the code for his project, so be sure to check it out if you occasionally forget to turn off your IR-enabled appliances. You don’t need to “pore over AVR assembly” without an arduino. Just write your stuff in C and replace the boring bits like toggling a pin with a macro. I think it is exaggerating, no assembly programming or hours of work are needed here. Just a piece perfboard, Tiny AVR and some C.
How about using a diode to make an envelope detector, followed by a comparator driving a capacitor at the base of a FET and relay? No digital stuff needed at all. I use two of these just fine and the total cost of all parts was under $5. I am a beginner and don’t have much expertise in electronic circuitry , but could you please tell me in detail about assembling a ” diode to make an envelope detector, followed by a comparator driving a capacitor at the base of a FET and relay”. Agreed. Too many Arduino users seem clueless and misinformed about other ways of doing things, and that’s sad. 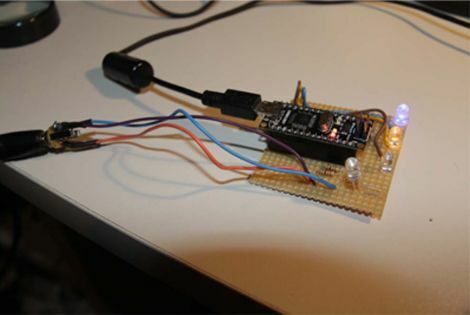 But no doubt he still did save some time by using an Arduino, and it is a very useful project. I like it! I need one of these for my amp AND TV. I’m with you! I think I might build this, using the “audio out” on the back of the TV. Too bad the Wii isn’t IR – shut that off too when the Netflix movie ends! Or use another microcontroller… PIC, MSP430, etc. So many options with free C compilers. In creating a one view instructable I wonder if zmashiah, is aware of the complaints of needing to be a “pro” user to view instructables as a single page? I also have noticed some instructable creators including a PDF file of their project within the instructable, thus bypassing the need to use the instructables’ download PDF feature to be able to view offline. I hope to get a glow in the dark HF receiver if/when one come available, at reasonable price when I can afford it. I’ll need to keep this idea in mind. This is a hack that require hacking to be usable with hollowstate equipment other than this remote controllable amp. If you use the “Autopager” extension for firefox, all pages are concatenated. Give it a try – works well for Hackaday too, along with other sites. I hate clicking “next page”, I just want to keep scrolling when I read! Instructables no longer requires you to be a pro to see one page view. as of a couple of weeks ago I think. Many people are not aware that it is not all that much more difficult to use the entire line of attiny/atmega chips with C than it is to use the arduino environment. They just need to know where to look and how to get started. Smiley’s tutorials are a great place to start, especially this one. Nice build, btw. Add a small electret mic and you wouldn’t have to put any more load on the output channel. I’m pretty sure that turning a tube amp on and off is the fastest way to wear it out…most of the energy used in the lifetime of a device is in the manufacturing process. If you wear it out faster and have to buy a new one, I think you’re being largely counter-productive. You don’t need a microprocessor to build something like this at all. Take the audio, buffer it with an op-amp, and drive the reset pin on a one-shot. Set the timeout period to something fairly long… let’s say 5 minutes. The one-shot drives a transistor, which in turn, drives a relay to the control amplifier power source. A push button could be used to toggle the one-shot and turns the amp on. From that point on, as long as you don’t have more than 5 minutes of silence, the amp will stay on. If you have silence for more than 5 minutes, the one-shot times out and the amp is turned off. Come to think of it, this would be a nice application for a 555.
you can always make this as simple as 2 transistors and a relay….and directly cut the power. You know, gcc have been ported to AVR for over a decade now. In my times, I’d do that with a 741 and a 555. I know some of you are critical of the “overkill” of using an Arduino but I must confess I have used them for projects at work. An Arduino nano can be had for less than $20 and it includes the microcontroller, the programmer and a voltage regulator all wired up. I attach the devices to be controlled and away I go. Time is money and doing anything more wastes time. Now if I was going to build 10,000 devices then maybe there is a more cost effective way. Are you talking about the overkill of using an Arduino compared to some other uC or the overkill of using a microcontroller for a job that could be effectively done by using by using an opamp and very small handful of passive components which can be had for less than $1 and require zero coding? I punched myself in the face when I read this. 555’s and analog would work, as suggested. But would you really want to regularly shut off a $1,200 amp by cutting the AC power with a relay, which is essentially just pulling the plug? Turning it off with the IR code is no doubt gentler on the equipment. A microcontroller is the right choice here. Madaeon on Need A Small Keyboard? Build Your Own! gersonfer liked Localino: Open Source Indoor Localization System. Tom Dowad wrote a reply on Colock LED clock. Tom Dowad wrote a comment on Colock LED clock. McCawley has followed a list. nikolai liked pcbtc (GaN edition). James Finch liked The $50 Ham: Dummy Loads. Bryan liked pcbtc (GaN edition). tas.devil.ger liked pcbtc (GaN edition).